Today it is grey and rainy but yesterday felt like spring. And how wonderful that was! Despite the soggy ground, covered in many places with deer pellets and dead leaves, I spent an hour or so wandering around the garden, enjoying the sunshine and the new growth that was popping up in every warm corner. For readers who live in milder climates or in places where spring has truly sprung, the thrill of seeing new growth may have come and gone. But living in a cold climate, where snow is still lurking in the shade, the strength of the thrill is hard to describe. I actually gasped when I saw this little leaf. How tiny it was, yet how strong it must have been to break through the litter and begin to grow. And isn’t the colour glorious? I think this is Heuchera ‘Obsidian.’ Or is it Ligularia ‘Othello?’ Both grow in this spot in the garden and both have dark leaves. 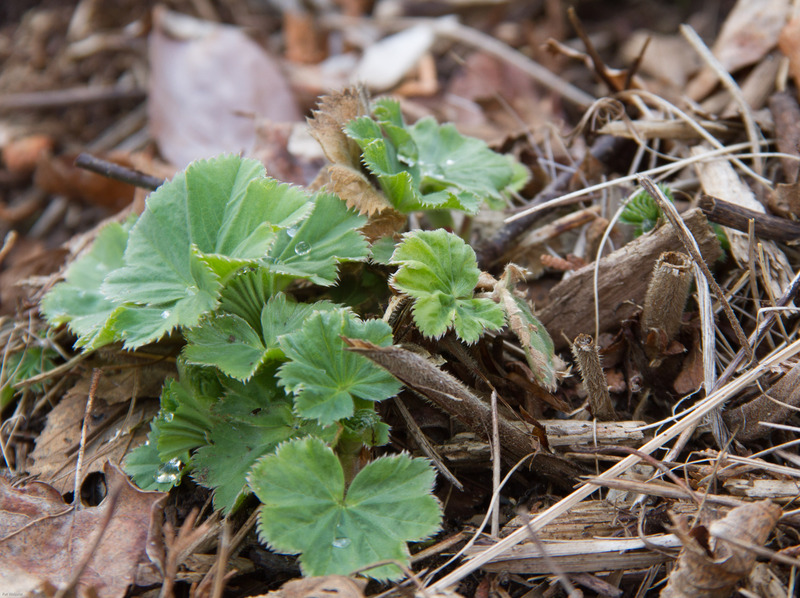 Seeing the quilted foliage of lady’s mantle (Alchemilla mollis) cradling the morning’s rain drops was like being awarded a medal for courage. Yes, we both survived the winter. The new leaves are soft and fuzzy. 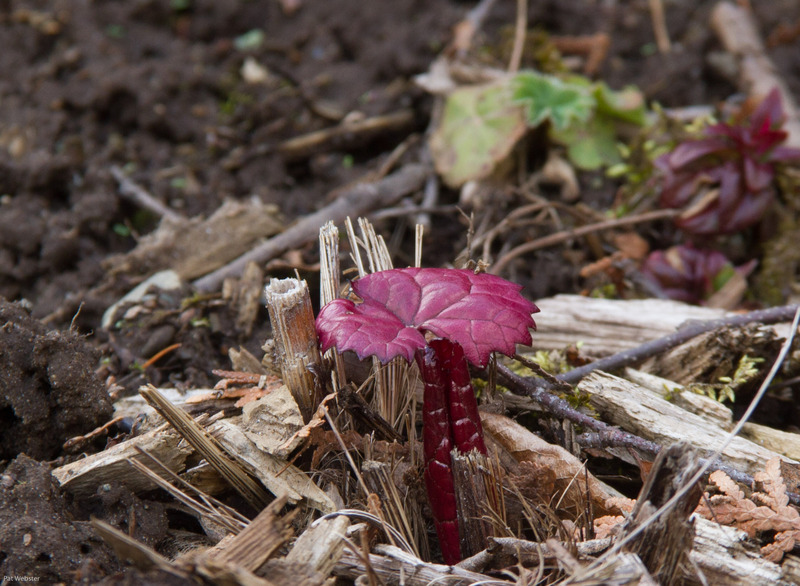 Everywhere, the new growth was pushing up through the chilly soil, reaching for the sun. 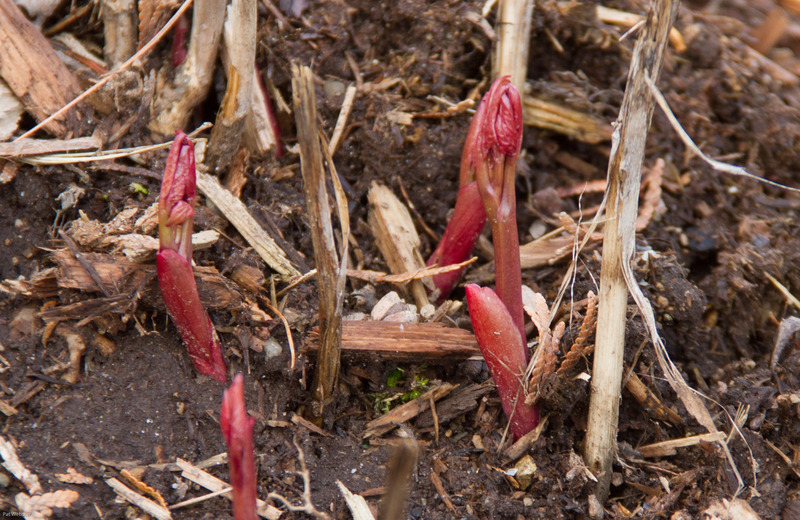 Peonies shoots were emerging, a gorgeous shade of red. As they push up through the ground the peony leaves are tightly folded, like hands in prayer. Water thundering over the dam signalled that snow was melting quickly on higher ground. 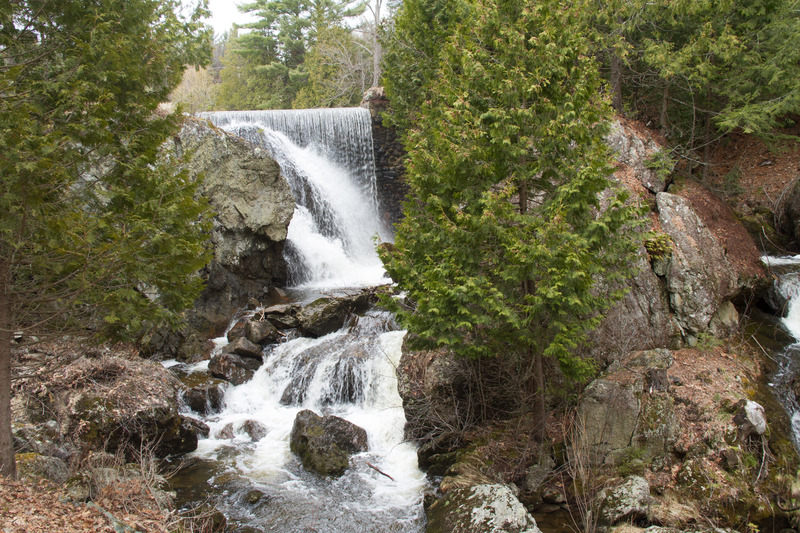 The sound of the water racing over the dam isn’t deafening but it is impressively loud. 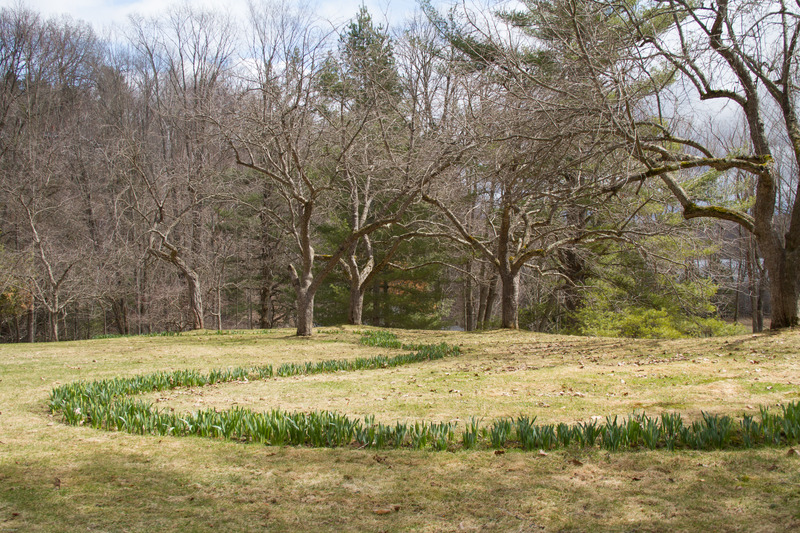 Nearby, the daffodils that form the Dragon’s Tail were still only a scribble of green, but soon they will burst into bloom. I replaced the muscari, or grape hyacinth, that turned the Dragon’s Tail blue with a mix of yellow and white daffodils. 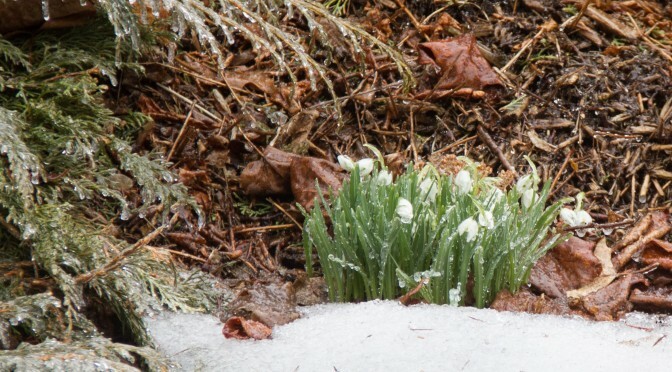 The deer ate the emerging muscari foliage, weakening the bulbs. 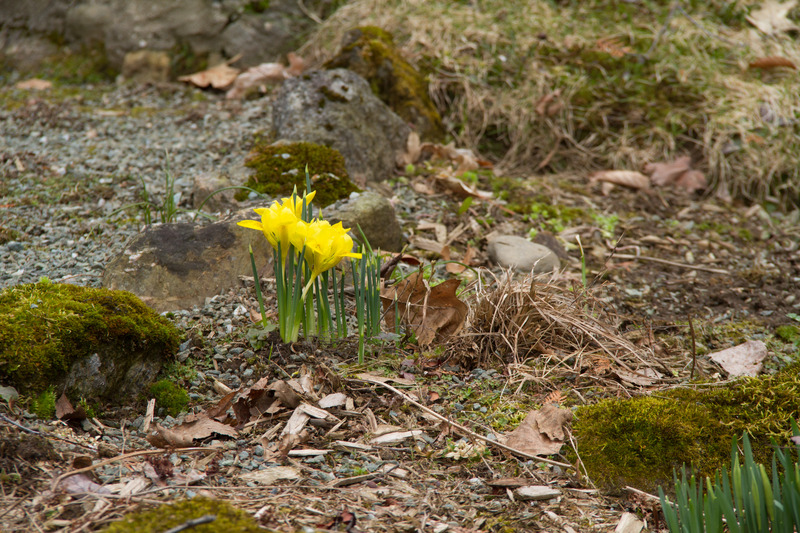 They leave daffodils alone. Seeing those signs of spring made me happy. But the biggest jolt of happiness came when I saw this little clump of good cheer. I had to crouch down to make sure of what I was seeing — a type of dwarf iris called Iris danfordiae. 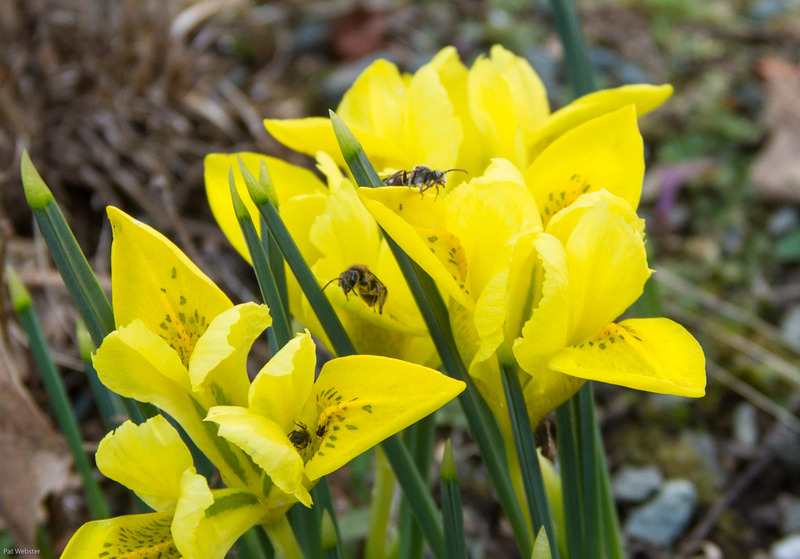 Yellow is a treat to the eyes after a winter of white. 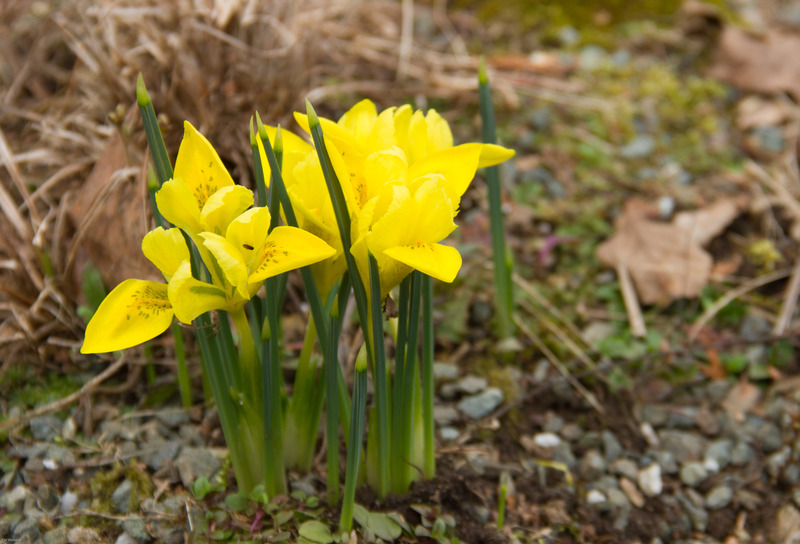 In 2005 I planted 100 of these bulbs, anticipating a burst of sunshine that would gladden my soul for years to come. But that’s not what happened. In my plant list the following year, I noted that the bulbs were not doing well. And then they simply disappeared. Spotting the clump, I rejoiced. Never give up hope, they seemed to say. 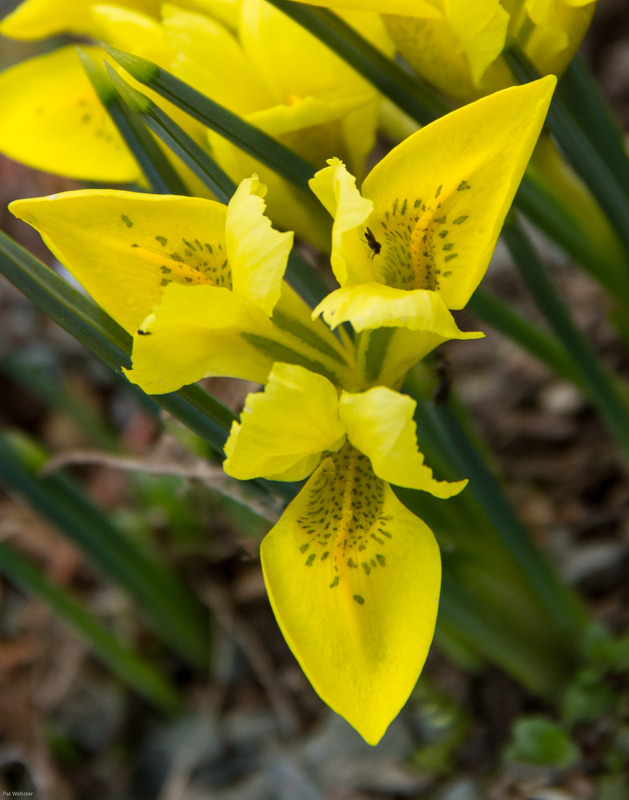 Poking around on the internet, I discovered that going for years without blooming is not unusual for Iris danfordiae. I learned that when they are left in the ground, the bulbs break up into bulblets which then need time to grow large enough to bloom. So next year, will I see even more? These dwarf irises are about 4 inches tall. The spots on the petals are described in the standard literature as brown. I’d call them green. Danford irises, first collected in Turkey in 1876, were named after their collector, a Mrs. Danford whose first name I wasn’t able to find. She was one of those intrepid Englishwomen who explored foreign lands in the Victorian era, botanizing and revelling in the freedom that came with exploration. A cheery face looks up to the sun. … only to discover that I wasn’t the only one who found the flower appealing! I’m linking this post to a meme sponsored by Helen, the Patient Gardener, called the End of the Month View. 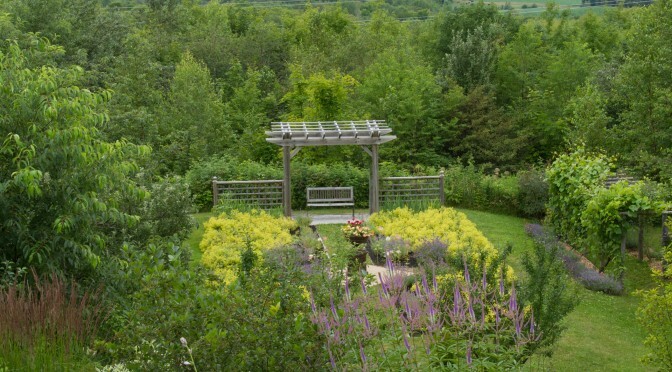 I didn’t know about this meme when I posted earlier today but it seems that I’ve written something close enough to an “end of the month view” to connect it to other garden writers around the world.